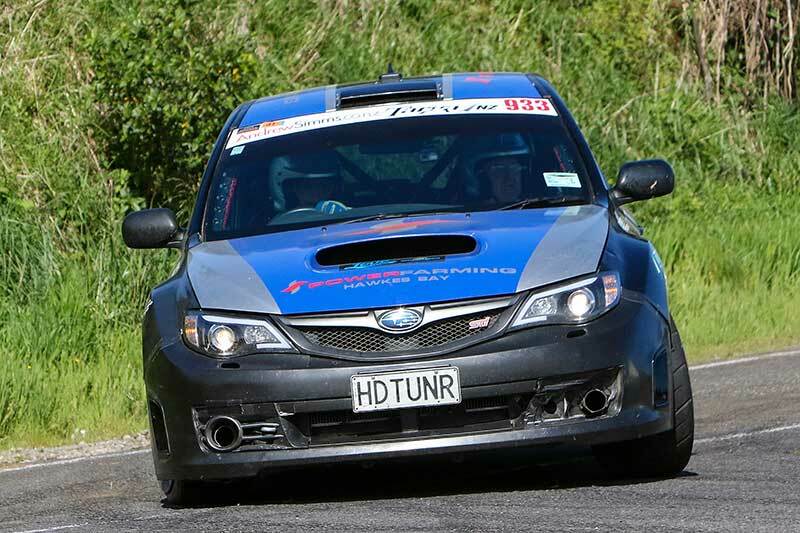 Glenn Inkster and Spencer Winn won Targa NZ. 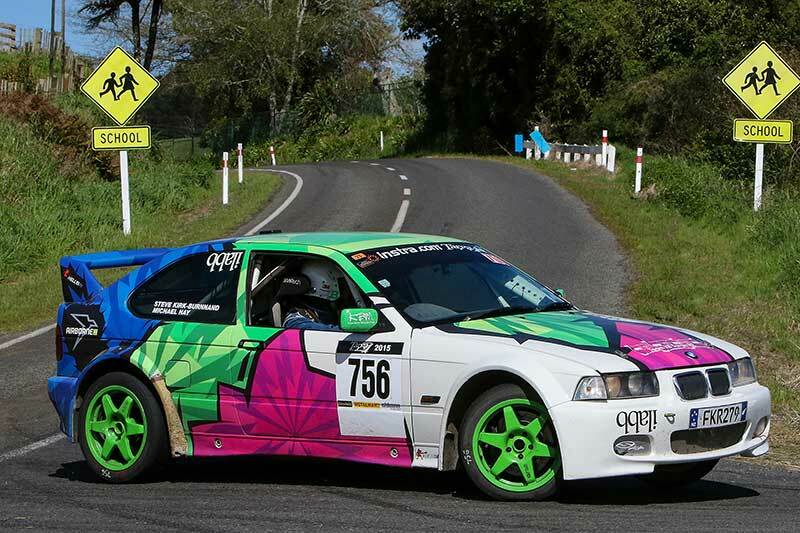 In claiming their fourth event win in as many years this year’s Targa New Zealand winners Glenn Inkster and co-driver Spencer Winn (Mitsubishi Evo 8) have matched the consecutive event record of previous event ‘King’ Tony Quinn and his co-driver Naomi Tillett. The pair, Inkster from Patumahoe near Pukekohe, and Winn from Howick in south-east Auckland, did it in some style this year too, winning the Lion’s share of the 28 closed special stages while – over the past two days – successfully managing a turbo manifold issue which twice threatened to see them parked at the side of the road. Inkster and Winn still have one more win to match circuit-owing entrepreneur Quinn’s total – five – but their dominance this year suggests that not even that benchmark will not be safe for much longer. The story of the 2017’s final day today was as much about what was happening behind Inkster and Winn, however, with fellow event – and Mitsubishi Evo – stalwarts Jason Gill and co-driver Mark Robinson rarely more than 30 seconds behind Nic De Waal and co-driver Shane Reynolds in De Waal’s Subaru Impreza WRX. Gill and Robinson grabbed the initiative by finishing second to Inkster and Winn in the day’s first stage – the 34km romp through Dreyers Rock north-east of Masterton – but De Waal and Reynolds were quicker than Gill and Robinson through the next one, the aptly named Carswell. Both were beaten through the 39km Carswell by Inkster and Winn and the Porsche 911 GT3 RS of 2013 Targa NZ winners Martin Dippie and Jona Grant. Dippie and Grant then went on to win the 13.1km Longbush stage (by 1.2 seconds) from Inkster and Winn, Gill and Robinson and De Waal and Reynolds. No matter what he tried, however, Gill could not bridge the gap on De Waal – overall and in the AndrewSimms.co.nz Allcomers 4WD class – with the final margin between second and third place just 30.8 seconds. A confident late charge was also not enough for Martin Dippie and Jona Grant to catch runaway Global Security Allcomers 2WD class winner Steven Kirk-Burnnand and co-driver Mike Hay who claimed both AndrewSimms.co.nz Allcomers 2WD class and first two-wheel-drive car home honours with fourth place in Kirk-Burnnand’s self-built BMW 318ti Compact. Consolation for Dippie and Grant came in their own class win – in Global Security Production 2WD – but they were still over a minute behind Kirk-Burnnand and Hay in fifth. Sixth after a great comeback drive after an incident on Friday was the first of the late model Mitsubishi Evo 10s of Auckland pair David Rogers and co-driver Aidan Kelly, seventh the irrepressible Grooten brothers, Tom and Ben, in Tom’s giant-killing Toyota Starlet. The innocent-looking but 2.0 litre turbo powered Starlet was consistently one of the quickest two-wheel-drive cars in the event and the brothers – their father is event stalwart Eddie Grooten – thoroughly deserved their place in the top ten. 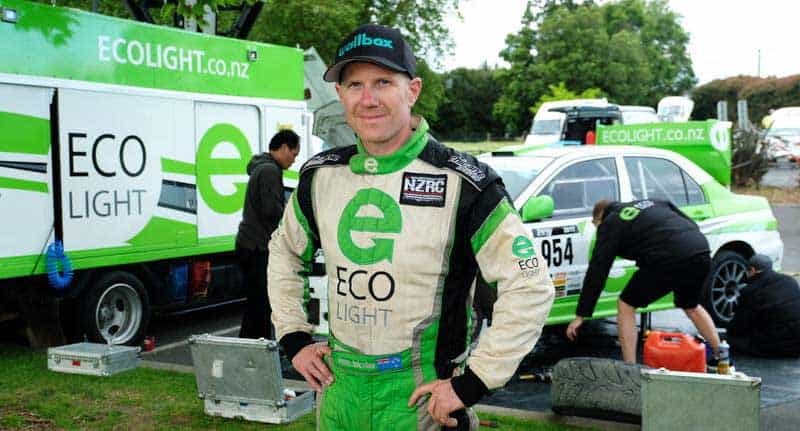 As did veteran New Zealand rally scene benefactor Brian Green who – with long-time co-driver Fleur Pedersen – finished eighth overall, and first-up AndrewSimms.co.nz Production 4WD class winner Ivan Knauf and co-driver Trevor Corbin who followed them home in ninth place overall. Closest finish of this year’s five-day 700+ special stage km event came in Metalman Classic 2WD where long-time class and event front-runners, Mark and Chris Kirk-Burnnand somehow managed to hang on after a problem in one of the later stages to beat the Toyota Corolla AE86 coupe of event-long rivals Rob Ryan and Paul Burborough home by…..0.3 of a second. After swapping the class lead back and forth on Friday it looked like the Kirk-Burnnands – Mark behind the wheel and his father Chris in the co-driver’s seat – had the goods this morning. But a driveshaft issue slowed the pair dramatically in the Longbush stage and they lost what had been an almost three minute advantage over Ryan and Burborough, who -as it turned out – had a problem of their own. That problem was a leaking main seal which saw them slow dramatically, with oil leaking into the clutch assembly, the stage before. Ryan’s crew managed to change the seal during the lunch time service, and get the car back on the road and with the Kirk-Burnnand BMW crippled and running well off the pace it looked like a forgone conclusion…until the final stage was cancelled and the result called after Stage 27…when the Kirk-Burnnands still – just – ahead!